Thursday is the one night of the week I get a late pass, usually. Fortunately this coincides with private viewings at the London galleries I follow as well as many other special events and launches. The only downside to this is if there are several happening on the same date that I want to get to, like tomorrow night. Deciding where to go and in what order isn't usually that hard, but from the sky it will look something like a pinball machine with regards to getting from one place to the next. Of course the offer of free beer and snacks help make up for any inconvenience. Below is my to-do list for tomorrow night. Seeing Nick Smith's previous work for Paramour in the flesh really cemented him as one of my favourite artists. I find his use of 'colour-chip' methodology, along with his subjective interpretation (giving his work alternate meanings up close and from afar) fascinating. Tomorrow night he's exhibiting at the Lawrence Alkin Gallery once again. Parlance consists of 40 original artworks, each piece new and exclusive to the show. Within this body of work are 20 iconic magazine-based pieces, whereby the publication acts as the canvas and the cover personality is the subject. Original cover text has been pixelated by Smith’s colour-chips and annotated with excerpts from the interview within the publication. 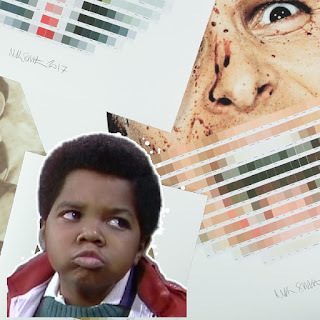 Famous faces to grace the series include Kanye West, Kate Moss, Lucian Freud, Banksy and Barack Obama, amongst others. To tie in with the launch of the latest issue, a brand new limited edition VNA Magazine x D*Face magazine box set is being released. The limited edition will be available exclusively at Rebels Alliance, D*'s very own motorbike cafe located in East London. Though I will most probably not try for a box set, I would like to pick up a copy of the magazine. The magazine features D*Face, Shepard Fairey, Søren Solkær, Haroshi, Wayne White, Tatiana Suarez but I'm really looking forward to seeing the work from Japan-based Aussie artist, Mark Drew, with his blend of hip hop and remixed rap quotes over Peanuts paintings. This will be my first look at work by French artist Jerome Lagarrigue but the images I have seen online of his previous work are enthralling. 'The Tipping Point' will focus on several subjects, from faces to natural elements such as fire and water. His art will show London the moments in history when things literally fall apart, all in his unique, sophisticated style. 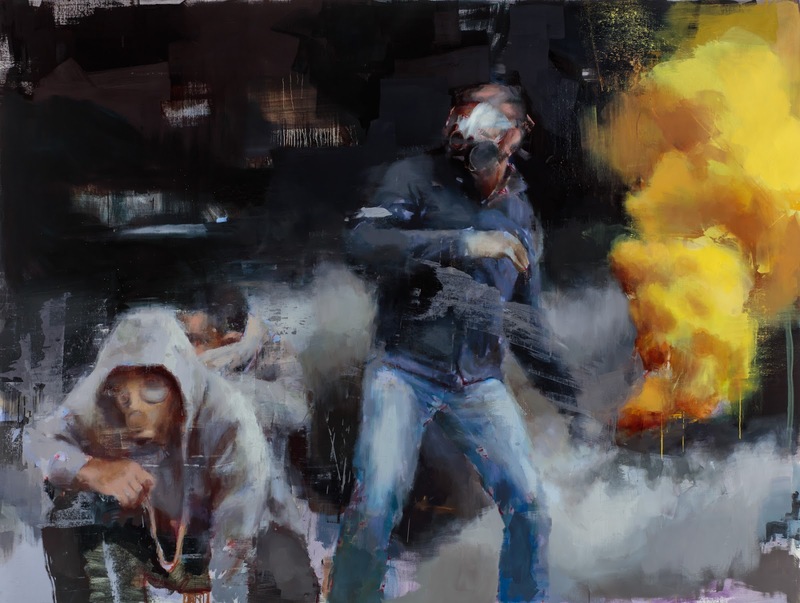 Culling from press footage and internet images of riots around the globe, Lagarrigue will present a series of large paintings, each of which acts as a lens into conflict zones without any particular geographical location and devoid of any explicit narrative. This lens, however, is a blurry one; his figures and landscapes exist in a state of near abstraction. I will most likely visit Rebels Alliance first as it's closer to the office and in all likelihood going to be the busiest of the three for the entirety of the evening. Then I will make my way West to Lazarides and the Lawrence Alkin Gallery. This should give enough time for the freeloaders and posers PR crowd to dissipate so the rest of us can get a look at these variegated exhibitions which lucidly illustrate the current political climate particularly with regards to the media, celebrity, and public opinion. If you are going to any or all of the above stop me and say Hi.